The airport sector, at a glance, may seem dull to investors with its near-monopoly structure and lack of explosive growth. 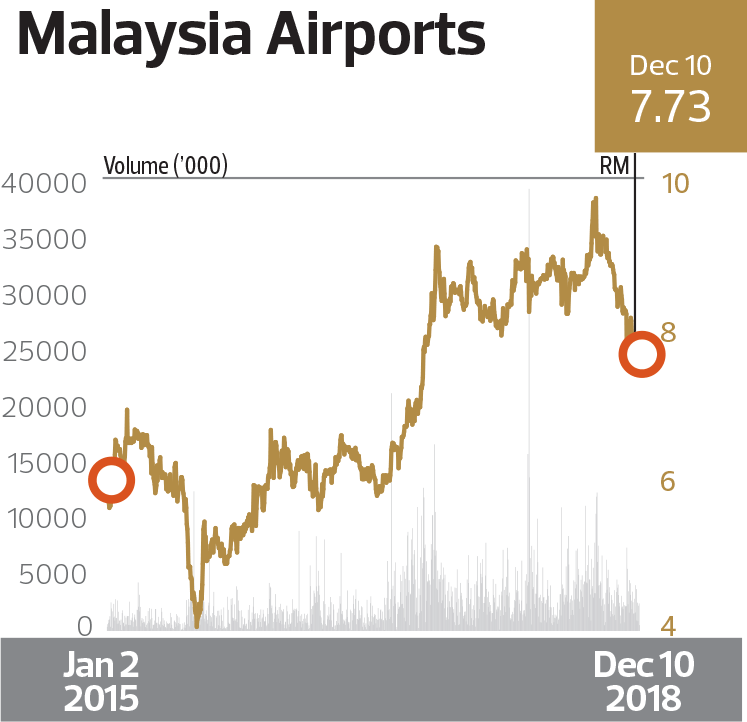 But underneath the drab, Malaysia Airports Holdings Bhd (MAHB) shines brightly when it comes to rewarding its shareholders over the long run, with its performance anchored in the stability of its sector-dominant business and steady upward trajectory. In terms of capital appreciation, the counter has performed respectably. It gained 48% from RM5.922 as at end-June 2015 to RM8.753 as at end-June 2018 based on adjusted price. MAHB made a cash call in late 2014, undertaking a one-for-five rights issue at RM7.90 per share to raise RM1.32 billion for the purchase of the remaining 40% stakes in its Turkish airport ventures, namely Istanbul Sabiha Gökçen Uluslararasi Havalimani Yatirim Yapim Ve Isletme AS and LGM Havalimani Isletmeleri Ticaret Ve Turizm AS. Shareholders who had subscribed for the rights issue should have seen decent gains with the additional shares in hand. The stock rose from RM5.95 on June 30, 2015, to RM8.80 on June 29, 2018, reflecting a three-year compound average growth rate of 14% — well above the CAGR of other players in the transportation and logistics sector. In fact, half of them saw negative returns in the same period. Apart from share price appreciation, MAHB has also proved itself able to declare regular dividends to shareholders. While it stuck to an annual dividend payout ratio of at least 50% of net profit from 2007, it has been more generous in the past four financial years. Between the financial year ended Dec 31, 2015 (FY2015), and FY2017, shareholders would have received a total of 31.5 sen in dividends. In terms of earnings, MAHB’s profit has been quite volatile. Net profit more than tripled to RM237.1 million in FY2017 from RM73.2 million in FY2016 and RM40.1 million in FY2015. It posted a net profit of RM663.3 million in FY2014. The big leap in FY2017 profit was driven by a hike in passenger service charges and consistent growth in passenger volume. Furthermore, the group booked higher depreciation and amortisation for its Turkish operations in FY2016 and FY2015. MAHB owes its consistency and steady performance to the nature of the airport industry and its structural dominance. Its structural monopoly, which can be traced back to its existence as a former unit in the Department of Civil Aviation, means its business is riding the upward trajectory of national economic growth. Operating 39 out of the 40 airports in Malaysia, MAHB is one of the world’s largest private airport operators. It has five international airports, 16 domestic airports and 18 short take-off and landing ports in its stable. About three quarters of MAHB’s airports are not commercially viable, so these are cross-subsidised by a handful of profitable ones. However, structural changes have been looming over the sector and MAHB will have its work cut out to sustain its consistent performance thus far. Among others, it is now contending with a new quality of service (QoS) framework designed to keep MAHB on its toes in respect of customer — that is, passengers and airlines — satisfaction. The QoS framework, administered by the Malaysian Aviation Commission, will see MAHB hit with financial penalties for any sub-par services. This necessitates capital investments that may be recurring, to some extent, to raise and keep up its service quality levels. In addition, the proposed airport real estate investment trust makes one wonder about the impact on MAHB’s earnings model as the REIT is expected to derive revenue from the user fee payable by the airport operator to the government.